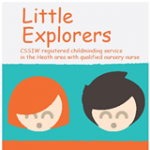 Hi, I'm a fully qualified nursery nurse with many years' experience in a private nursery as well as having my own 2 children. I hold first aid and food hygiene certificates. I am a PACEY member. I live in the Heath area and pick up from Ton Yr Ywen school. No pets. Childcare vouchers accepted. I offer full & part time care as well as wrap around care. Cardiff and Vale Healthy Snack Award plus holder. After many years in the financial sector I had the opportunity to retrain and completed levels 2 and 3 National Diploma in Children's Care, Learning and Development. I am a fully qualified childcare practitioner. I also completed courses on Forest Schools, safeguarding and childhood nutrition as well as various health & safety courses. Level 3 Diploma Children's Care, Learning and Development. I have spaces for full & part time care each day. I also provide wrap around care. Full day £45. Wrap around care £22 per day.